Lets face it, electric or gas water heaters usually fail at the worst times. In the case that your water heater is beyond repair, we’ll work with you to determine a solution that best fits your needs and budget. Although it may cost more upfront, it is cheaper in the long run to replace your water heater than it is to keep using your inefficient one. If you need a repair call us to get the job done. Our highly skilled plumbing technicians can perform any water heater repair. 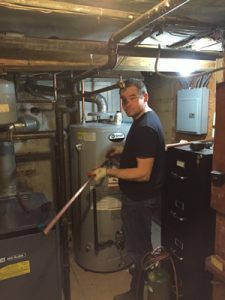 Plus, we carry all the best products — from tankless water heaters to traditional tank water heaters — so we know how each make and model works, and can get the job done quickly and professionally. As with most appliances, routine maintenance keeps them doing their jobs, and water heaters are no different. Reduce energy costs and maximize efficiency by installing a tankless water heater. With tankless water heaters, you’ll never have to sacrifice comfort or convenience. Tankless Water Heaters use gas burners or electric coils to heat water on an as-needed basis, which saves big-time on energy bills. Imagine having a continuous supply of hot water. Yes… with a tankless system you can run your dishwasher or your washing machine…and still get a hot shower! They are compact in size, energy-efficient in design, and low-cost to operate. Our technicians have the expertise and background knowledge to help determine a water heater solution that’s best for you. Call Chelsea Cooling and Heating and let our quality technicians take care of your water heater repair or installation today!